We are living in the Golden Age of effect pedals. The sheer number of choices available is breathtaking, the overall build quality is superb, and the creativity embodied in many is truly mindboggling. One can easily imagine Jimi Hendrix suffering from a severe case of option anxiety were he to be suddenly transported to the effects department of a present-day music store from, say, 1969. Hendrix would also probably be intrigued by the concept of the pedalboard, as its inventor Pete Cornish built the first one for Yes’ Peter Banks in 1972. Cornish is still building custom pedalboards for professionals, though he’s now joined by other luminaries like Bob Bradshaw of Custom Audio Electronics and Dave Friedman of Rack Systems Ltd., as well as more than a dozen less-celebrated boutique board builders. These folks don’t exactly work for peanuts, however, so most musicians will find their expertise out of reach. Happily, there are many excellent prefab possibilities open to the DIY pedalboard enthusiast, ranging from the diminutive to the massive, and priced at between $30 and $500 USD. Some custom pedalboard builders, such as Trailer Trash, also offer unwired and partially wired boards for relatively low prices. 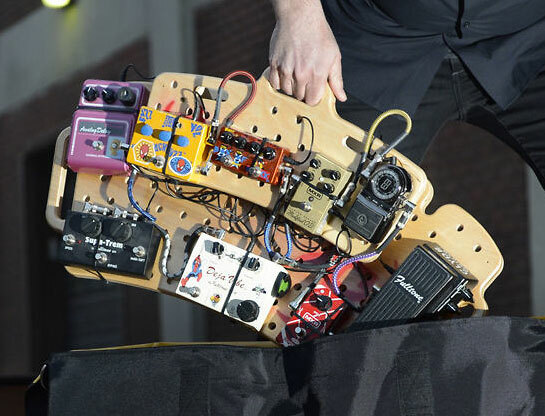 Guitarists are by far the largest population of pedalboard users, so they’re the focus here, but most of the following tips apply equally to other instrumentalists and even adventurous vocalists. Carefully consider your present and future needs before building or buying a pedalboard. Decide which pedals you want to have and what order they will be placed in before doing anything else (see Ordering Determines Outcome below), then connect them all together to determine precisely how much space they require. Bear in mind that large or oddly shaped pedals sometimes present special problems, as do pedals with unconventionally located inputs and outputs. Holeyboard Pedalboards have ergonomic features like an angled top shelf and curved base. Ergonomics are also important when positioning pedals that require easy access, such as loopers and volume, wah and expression pedals. And if you choose a large board with a row of pedals in the rear, be sure your legs are long enough and your balance steady enough to reach them without compromising your cool. Overall size and weight also are obviously critical concerns for musicians who fly or take public transportation to gigs. Cosmetics may also be a consideration. If a bunch of pedals haphazardly slapped on an unseemly slab with wires running all over the place suits your aesthetic, go for it. If, however, you prefer more tidiness, a board with, say, a compartment underneath where cabling may be routed out of view and power supplies and other components concealed will be a good choice. Boards with risers also typically include enough space underneath for at least a single power supply. Finally, those prone to mission creep are advised to plan ahead so as to accommodate additional pedal deployments when they occur. Whether you opt for a basic board, something a little fancier, or a fully tricked-out custom job, wire it using professional-grade cable and connectors. Pro pedalboard builders routinely opt for products from proven manufacturers, such as Mogami and Belden cable and Neutrik connectors, though there are numerous other excellent options. George L’s cable, for example, is quite popular, but avoid solderless connectors. No matter what type of cable you choose, always—repeat always—use soldered connectors. Cable quality is crucial because every inch of wire between a guitar and an amplifier contributes to the overall attenuation of the signal flow by increasing capacitance, resulting most noticeably in a reduction of high frequencies. The problem is exacerbated by the capacitance inherent in the pedals themselves, even those purporting to be “true-bypass,” as well as other factors. This is a complex issue that may be viewed from multiple perspectives, but experts agree that cutting corners on cabling is never a good idea. Without getting into the controversy surrounding true-bypass and buffering — you can read Pete Cornish’s "Case Against True-Bypass" for his erudite take — it is safe to say that buffering will greatly improve the performance of your pedalboard. In a nutshell, a buffer converts a high-impedance signal, such as the one coming from your guitar’s output into a low-impedance signal. That’s important because low-impedance signals do a considerably better job of running the capacitance gauntlet produced by the cable, connectors, pedal circuitry and other components in your signal chain, thus resulting in a sound that more closely resembles what you hear when your guitar is plugged directly into your amp. However, there are buffers and there are buffers. Many pedals actually come equipped with built-in buffers, though they vary in quality and performance. Boss pedals, for instance, contain buffers, and having one or more of them in your signal chain can be helpful. However, they aren’t a substitute for high-quality buffers, such as the custom circuits employed in professional effects systems, or even widely available products, such as the MXR MC406 CAE, which was designed in collaboration with Bob Bradshaw. But beware of having too many buffers in your signal chain, as they may have a cumulative effect that can introduce yet other problems. Another caveat when using buffers is that they don’t always play well with others, particularly pedals with discrete transistor circuits, such as the Dallas Arbiter Fuzz Face. It’s the interaction of the guitar output, cable, and fuzz input that enables the Fuzz Face to clean up so beautifully when you roll back the guitar’s volume control, and inserting a buffer or buffered pedal before the fuzz eliminates that capability. That’s why fuzz pedals of that type typically work best at the beginning of your signal chain, just after the guitar. Cable capacitance and un-buffered signals aren’t the only threats to the integrity of your signal; another potential peril lies within the pedals themselves. Some pedals, especially of the vintage variety, are born tone suckers. Not only can they devour high frequencies like audio black holes, they can emaciate the overall signal and output level, inject nasty noises, and more. Even some modern pedals can wreak havoc with your tone. Fortunately, there’s a solution to this problem, which can also help address the other tone-sucking issues. Loop switchers are available in many forms, from simple single-loop pedals to those with multiple loops to programmable systems that enable you to switch different combinations of pedals in and out by pressing a single footswitch. What they all have in common is isolation. Placing a pedal in a switchable loop allows you to isolate it from your signal chain entirely. The switcher itself is still in the chain, of course, but the offending pedal isn’t. An added benefit of using a switcher is that if it has enough loops to accommodate all or most of your pedals, it really doesn’t matter where the pedals are located on your board, as reaching them with your foot is no longer an issue. And programmable systems not only enable you to engage multiple pedals simultaneously, some also allow you to switch the order of the pedals in the signal chain, and a few offer stereo loops in addition to the standard mono variety. The conventional wisdom is that pedals should be arranged in basically this order: wah/envelope filters, compressors, fuzz/distortion/overdrive, octaver/pitch-shifters, modulation, delay, reverb, with a volume pedal going pretty much anywhere before the delay, so as not to cut off the repeats. Of course, Fuzz Face users will need to take a different tack, and lots of people, including myself, prefer wahs and filters after fuzz and distortion. I also prefer to have the volume pedal after the fuzz, especially if the fuzz is noisy, as then it can function as a manual noise gate in addition to producing more effective volume swell effects. All that said, try arranging your pedals in every way possible just to see what happens before settling on the final order. Who knows? You may discover that you dig the sound of overdriven delay or compressed reverb or that you get a wholly unexpected result like the iconic wailing noises David Gilmour made on “Echoes” by plugging his wah pedal in backwards and manipulating the volume and tone controls on his guitar. Finally, if you have a single pedal with stereo outputs and you place it at the end of your signal chain, great. But if you have more than one stereo pedal there could be a problem, as many of them have mono inputs and even those with “stereo” inputs actually sum to mono before processing. Only “true stereo” pedals will actually pass stereo signals intact from the inputs to the outputs. Unless all of your pedals operate on batteries and you enjoy changing them, you’ll need a power supply. Options abound, but which one is best depends on the voltage requirements of your pedals. Some are AC and some are DC, and woe to anyone who confuses the two. Pedals typically run on 9, 12, 18 or 24 volts. Some are wired tip positive and others tip negative. And they can draw between 3mA and 500mA, so you’ll need to be sure your power supply is robust enough to handle your hungriest pedals. The sole exceptions are fuzz pedals, some of which function noticeably better when powered by batteries. And if any of your pedals run on 120-volt AC, you may need to connect them to an onboard or external AC outlet. As with cabling, don’t attempt to cut costs when it comes to powering your effects. In addition to the above considerations, seek out regulated supplies featuring isolated taps with no common grounds, such as those manufactured by Voodoo Lab, which enjoys an excellent reputation among pro builders. About the author: Barry Cleveland is a San Francisco Bay Area-based journalist, author, guitarist and composer. He was an editor at Guitar Player magazine for 12 years and at Mix and Electronic Musician magazines. His book, Joe Meek's Bold Techniques is a cult classic, and he contributed to Whole Lotta Led Zeppelin: The Illustrated History of the Heaviest Band of All Time. He has released five albums and composes music for film and television.